I am both introverted and shy. (Note: not to be contrary, but sometimes I do use those words interchangeably. I apologize in advance if that causes confusion). Earlier in my life, the shyness was almost a handicap of sorts, in that I could barely leave home without experiencing serious anxiety. It was crippling, paralyzing shyness. I couldn’t speak, I couldn’t even look at people. I was terrified of almost everyone and just wanted to disappear. I remember being in my mid-teens and getting tipsy on alcohol (we started young with that sort of thing on the prairies, where excessive drinking is celebrated as an extreme sport in some circles) and the miraculous feeling of having my inhibitions removed. I could drink the shyness away! When drunk, I could talk to anyone. And I did. I discovered the heady joy of having people listen to my stories, laugh at my jokes, wanting me to hang out with them. It was a revelation! I also knew it was very dangerous. I was conscious of the fact that I could so easily become an alcoholic. That terrified me even more than going through life as a painfully shy girl. I knew there was no easy way out of it. So I forced myself out of my comfort zones. I enrolled in the biggest, most terrifying school I had ever seen (up to that point in my sheltered life) – the University of Manitoba, to study fine arts. I got a job working in retail where I had to talk to strangers in order to earn a livelihood. I got myself an apartment of my own in the big city. Along with each of these things came tasks that forced me to do stuff I was not comfortable doing: applying for a student loan; going to unfamiliar places alone; getting on the phone and talking to strangers; asking questions; making my voice heard. Anyone who isn’t extremely shy may not understand how difficult these simple things can be. But I am. And I get annoyed with extroverts who say they are shy. I’m telling you, don’t even go there. Being a little reserved and uncomfortable in the presence of strangers is NOT shyness. It’s normal. Shyness isn’t cute and charming and demure. It’s a curse. When you’re shy, you live much of your life inside your head. Let me try and explain that. There is a constant inner monologue. For instance, I might be out at the store, getting a few groceries, and I see someone I know. Here begins the inner wrestling match with myself. Part of me is rehearsing things I could say. “Hi, Jen.” “Hi.” “Oh hey, how’s it going?” “Hey there.” What if I say something and she doesn’t hear me? I’d feel like such a schmuck! The other part of me is looking for an escape route, wondering if she already saw me, if she’d notice me as I’m running the other way. This is just one example of a typical, awkward situation a shy person can find herself in every time she leaves the safety of her house. It’s a borderline social phobia. Maybe past the border. Maybe just all-out social phobia. I am, in general, a terribly awkward, socially inept individual. But I have learned to overcome this to a point where I can actually fake social graces in certain situations, but only in brief spurts, and only when absolutely necessary. Faking extroversion is exhausting. Less so when there is alcohol involved. But there I digress. Just so you can fully appreciate the kind of awkward I’m talking about here, let me share another scenario: picture me walking down the street when I unexpectedly encounter someone I know. I’ll do a quick double take at the moment of recognition, stammer “hi, how are you?”, and they’ll smile as they’re passing by and say “oh hi, I’m good, and you?”, to which I’ll respond “I’m good, how are you?”, as I turn and start walking backwards so I can still face them, then trip and fall back over a sandwich board on the sidewalk, tuck and roll, jump up and smile and wave to show them I haven’t broken any bones. All the while, I’m sort of chortling uncomfortably and my face is turning hot and red. My social awkwardness and shyness, I believe, makes it difficult for people to get to know me. I have a hard time trusting, and maybe that makes it difficult for people to trust me. I don’t know. It’s a conundrum. And yet, somehow in my life I have been blessed with really great friends. I’m eternally grateful for each one. 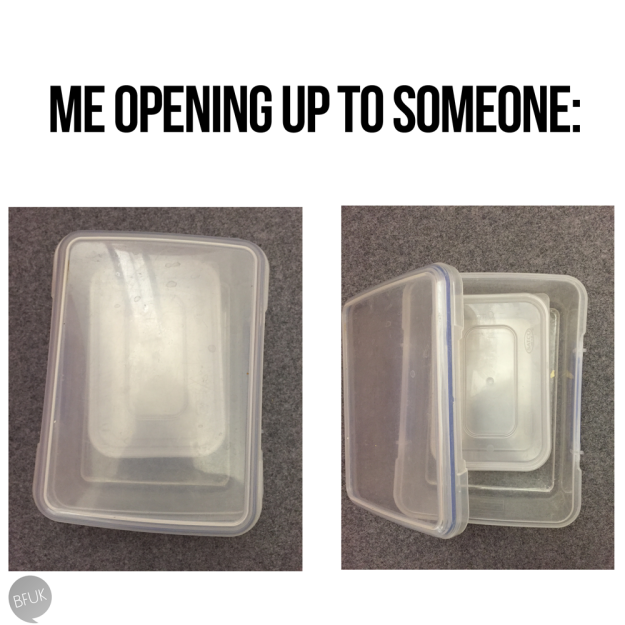 And I feel like there’s always room for more. Friends are the chocolate chips in the cookie jar of life. (Is that too cliche? I saw it somewhere years ago and have used it freely ever since. No idea whose quote it actually is. Is that bad? It probably is). Shyness is something I have worked very hard at overcoming. It’s an ongoing battle. But being an introvert isn’t something to overcome. It’s something to embrace. Being introverted is not a personality flaw, it’s a personality type. Are you shy? Introverted? Feel like they’re one and the same? 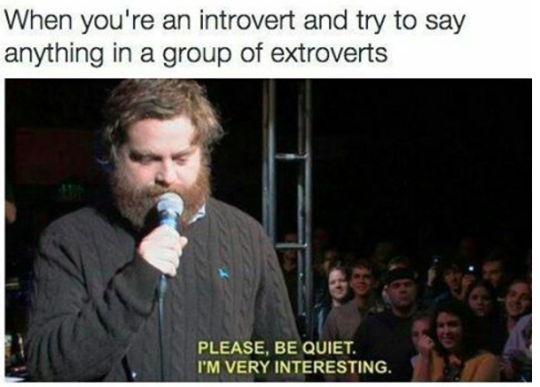 Or are you an extrovert with introverted friends? I’d love it if you shared your thoughts! Hello there! First of all, I wanted to thank you so much for the follow on my blog. Second, wow…I’m a total introvert, too! I don’t have a whole lot of real life friends at the moment (one that I keep in contact with through email who lives in a different state from mine, but we’ve known each other over a decade and we’re such good friends that she’s like family to me; I may end up in contact again with another old friend soon, if my friend is able to get my email address to him), so a lot of my social interactions are primarily online and with common sense caution. Sometimes my shyness can be debilitating, but it’s also allowed me to explore things that genuinely interest me and develop skills in those interests (hence why I knit like a banshee). I do tend to be louder and more boisterous around my family and those I am comfortable with, but it can take a while for me to get comfortable around people. It seems like you live a pretty full and interesting life in spite of your introversion, and I’m genuinely interested in reading about your journey through life. Hi! So nice of you to follow me back! 🙂 I like your perspective on shyness, and how it’s allowed you to explore your interests. I never thought of it like that. But it’s true for me too! And I also knit like a banshee.